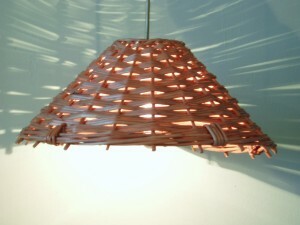 We supply willow lighting! Custom built lampshades to homes, restaurants, bars and clubs. 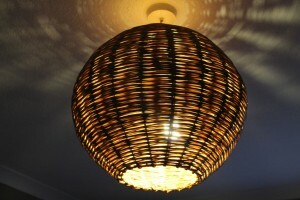 Working with a local frame maker we build and weave the lampshades to the size and specification of your choice. It may also possible (depending on the shape and requirements) to make the shades without a frame – which saves on cost. 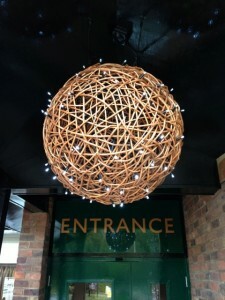 Call Alison on 01294 829012 or send an email with details of your willow lighting project and we’ll take it from there. We’ll work closely with you to ensure your ideas are brought to life. Below there are different categories of photographs depending on whether a frame has been used, the positioning of the light fixture and the style of weave, which may give some ideas. The custom made options page gives more information on the various weaves and willow colours available. Also please visit the customer review page for feedback from our customers. 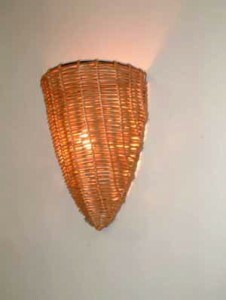 Willow lighting creates mood and attractive patterns on nearby walls and ceilings. It’s perfect for creating a warm calm relaxed and romantic atmosphere. For our friendly, professional advice about your willow lighting project, please send an email or call Alison on 01294 829012. All of these we had to make outside!